One of the most popular types of siding being used in Downriver Michigan today is vinyl siding. Vinyl siding has been around for almost 50 years and is economical to install and look great on the home. There is another popular choice of siding called James Hardie siding which has been around for more than a decade and in that short time has really made an impact on the siding industry. There are similarities between these two siding choices in Downriver Michigan but one is far superior. We’ll compare the differences of James Hardie siding and vinyl siding in Downriver Michigan in this article and explain why it is important. The ultimate choice of what siding material you have on your home will of course come down to your personal choice. Both James Hardie siding and vinyl siding are great siding choices and both can make your home look absolutely amazing. Most of the points we’ll mention below may seem a bit trivial in some cases but can massively impact how well your siding protects your home, how long it lasts, and more. We’ll also discuss why these siding choices are different based on the location of the siding which is Downriver Michigan. Climate plays a role in how the siding performs. Vinyl siding comes in a variety of different thicknesses. The thicker the vinyl siding the better the quality and of course the better quality vinyl siding. So the warranty on higher quality vinyl siding is typically about 15 years which is the useful life of the siding. For James Hardie siding the warranty is a much longer 25 years. So in terms of durability you’ll need to install vinyl siding twice when compared to James Hardie siding. Vinyl siding comes in a variety of different styles and colors. In fact, vinyl siding also comes in shake designs as well as standard lap siding designs. Colors for vinyl siding is vast with as many as 100 different colors to choose from but they may be limited to the brand siding you choose. For James Hardie siding there are some different design options which don’t yet include shakes. But for the colors available it’s huge. James Hardie siding can be pre-painted at the manufacturer or painted by the home owner so your choice is color is relatively unlimited. Get a barbecue grill too close to vinyl siding and you are likely to melt the vinyl siding. Heat it up a bit more and you may even set your home on fire. For homes with vinyl siding this is a big problem. For homes with James Hardie siding however, it’s not that big of a deal. James Hardie siding is fire resistant and will not warp or crinkle like vinyl siding does when it is exposed to heat. Since the James Hardie siding is made from fiber cement it does not burn which can protect your home. James Hardie siding combined with metal roofing or tile roofing gives your home an excellent barrier from structural fires. Vinyl siding has air space behind each plank due to it’s thickness. This air space can be a home for insects such as ants and bees. James Hardie siding fits more closely to the home which eliminates much of the air space and also eliminates the home for the insects which can invade your home. While the summer in Downriver Michigan doesn’t pose a threat for vinyl siding the cold of winter does. As the temperature drops to freezing or below the vinyl siding on your home can become more brittle and crack much easier. James Hardie siding performs the same in hot or cold weather and does not suffer this problem. 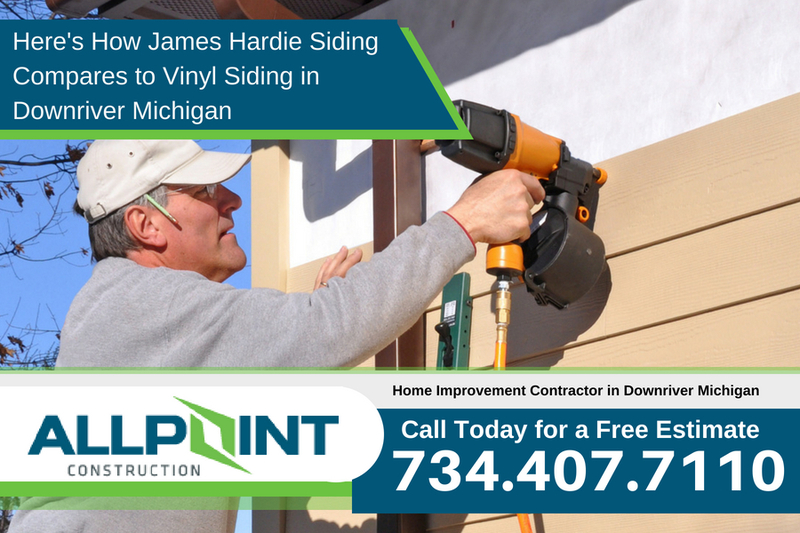 Want to learn more about the price difference in vinyl siding and James Hardie siding in Downriver Michigan? Be sure to call All Point Construction today at 734-407-7110 for a free quote. They are a fully licensed and insured siding contractor in Downriver Michigan.